There is a common belief that Nat Fyfe’s fantasy ceiling lies around 100-105, and looking at his career averages that rings true (Career best average of 105). However I’m not sure it could be further from the truth. In 2015 he was averaging 110.8 before Sam Mitchell got him good. In 2016 he scored 121, 122, and 137 before breaking his leg on 59 in the second quarter. In 2017 he wasn’t fully fit having missed pre-season, and last year he finally took the last step to becoming the uber premium scorer he always should have been. Between Round 2 to Fremantle’s bye, Fyfe averaged 114 over an 11 game span. In that time he averaged over 31 disposals, 5 marks, 4.5 tackles and a goal per game. He can do everything from a fantasy perspective. He doesn’t live off cheap +6’s, he’s an absolute beast in the air. He will rest forward and kick goals, allowing his TOG to live near 90%. Best of all, he’s basically untaggable due to his size and strength. His inefficiency is another factor, and even if he does get tagged fear not, he can just push forward and dominate there. This is what Nat Fyfe offers, and if he stays fit he will average 110+ with ease and finish inside the top 8 midfielders. Luckily we can select him at an average of 102. Against the Lions in Round 15 his string went ping on 36, discounting his price by a full 5 points. That average of 107 also included a score of 57 in a Round 23 dead rubber against Collingwood, who held him for 2 of his 3 scores under 90 for the season. Without Titch in 2019, we’ll be after captaincy options and Fyfe’s record at Optus Stadium is off the charts. He averaged 123 in 6 games at home before injuring his hamstring on the way to another huge ton. He has a high ceiling too, scoring 120+ in 40% of his games last year. Interestingly, Macrae did it in 43% of his games. Fyfe isn’t just value, he’s an armband option as well. I shouldn’t be telling you anything new here, Nat is a Brownlow medallist. However I feel he’s under appreciated in Fantasy circles, usually selected by the casuals who base their selections on player names over Fantasy ability. Fremantle have signed some key targets up forward, but their midfield is extremely young and inexperienced. Fyfe should get all the time on the ball he can eat. He’s in his prime and set for a monster year. Reliability. It seems to be a common theme in my decks so far this pre-season, but when you’re buying players at a discount there’s always a reason. He played just 15 games last year and only played 5 in 2016. In fact he has managed over 20 games in a season just twice in his entire career, and has NEVER played all 22 games. Suspensions seem to follow him like a bad smell as well. It’s almost a guarantee that Fyfe will miss a game or two and that needs to be factored in when selecting him. That’s the only real drawback I see here, how he deals without having Lachie Neale winning the ball alongside him is the only other question mark. Neale has only missed 2 games in the past 5 seasons compared to Fyfe’s 33, so it’s an unknown. It should only benefit Nat as Fremantle’s reliance on him increases further if that’s even possible, and no opposition is shutting him out of a game with his height and size. However a lack of support and extra workload won’t help his durability. KING – If not for his injury history it would be an ace. Fyfe is a safe 110 if he can stay fit and he has a nice discount. There is so much value in midfield this season so squeezing him in may be tough, but Fyfe is a gun. There is certainly risk involved, but the reward is just too tempting for me. At the very least he needs to be high on your watchlist. 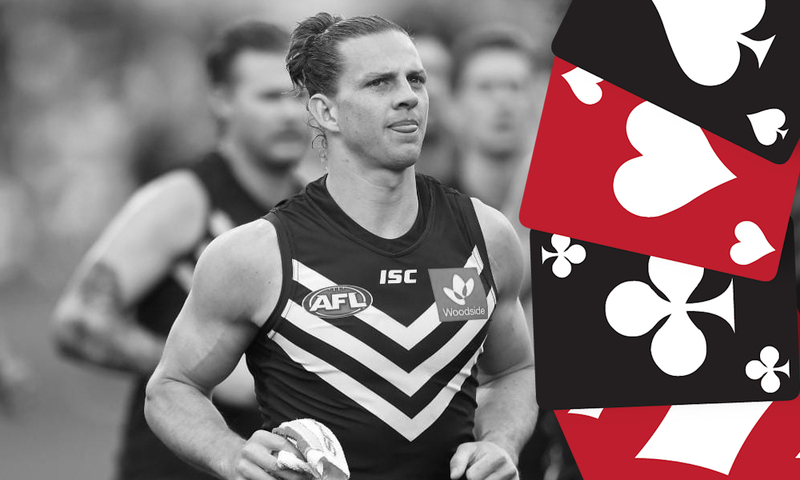 Will you take a chance on Fyfe? Great article Matt, good to see someone acknowledging his fantasy ability before injuries plagued his averages in 2015, 2016 and 2018. How do you see Blakely’s injury affecting Fyfe, he’ll have little midfield support with just Mundy, Cerra and Brayshaw the only other permanent inside mids. Will he be worse off without support or better off due to the reliance placed on him? I can’t see him being worse off as long as his midfield minutes remain high, which they have to. Doesn’t concern me at all! I don’t think I’ll bother with this, this year. It takes up too much of my time, and when it comes down to it, it is really not worth the effort.